Ice Hopper Creepers were designed for ice fishermen and built to last. 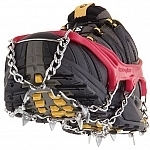 No other ice cleat, boot spike or spur available today provides this level of extreme traction, durability and strapless on-off portability. 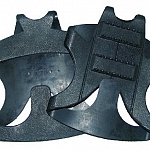 The extra thick elastomer harness was designed to remain flexible in Arctic temps and still retain elasticity. 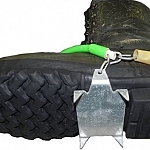 The high grade stainless chains and 11 self cleaning, stainless cleats are engineered and strategically positioned to provide maximum traction, even on wet, glare ice or uneven ice surfaces. The ice blue color is easy for you too see, but not for the fish below. Ice Hopper Creepers are currently available in size XL and XXL to fit most popular style hard water pack boots and Mickey Mouse Boots.